Ferrari just announced the Evo version of its LaFerrari-based FXX-K, and my god have the aerodynamicists gone crazy with it. Ferrari showed the new hypercar at the Finali Mondiali race at the Mugello circuit in Tuscany. The car, which the Italian automaker says melds various design elements from Formula 1, GT3, GTE and other racing series, is not only lighter than the FXX-K (thanks to an F1-derived carbon fiber forming process), but it’s also got quite a bit more downforce. Ferrari says it spent a year running computational fluid dynamics simulations and wind tunnel tests to get the FXX-K Evo’s downforce numbers on par with GT3 and GTE cars. The result is a 23 percent better downforce coefficient than the FXX-K, making the new car’s coefficient 75 percent better than the road car, the LaFerrari. 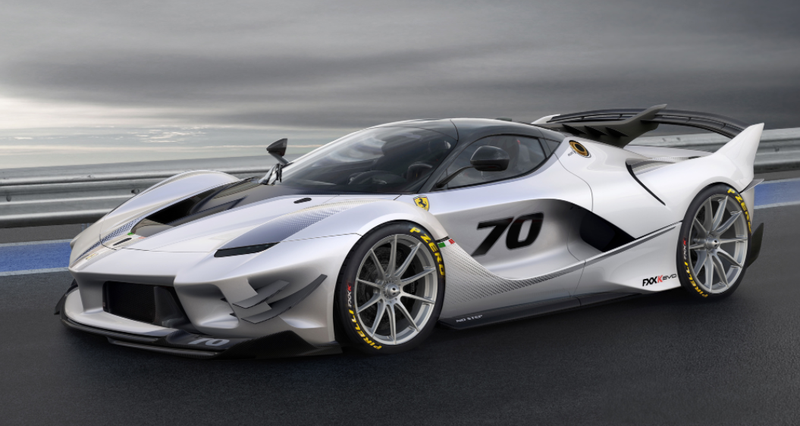 In practical terms, that means that at 124 mph, the FXX K Evo will make 1,411 pounds of downforce, and at the car’s top speed, that number goes up to an insane 1,830 pounds. For reference, that’s about the weight of a Clydesdale horse. Ferrari says the “twin-profile” fixed wing on the tail was a big part of that added downforce, and that it works “in seamless synergy” with the car’s active rear spoiler, whose controls logic Ferrari reprogrammed for this application. Those vortex generators, Ferrari says, help clean up the wake exiting the ducted cooling module from the hood before that air strikes the wing. It also creates a “downwash component in the flow,” which apparently helps the twin-profile setup to produce downforce. This all results in 10 percent more force pushing down on the back of the car. Engineers also enlarged the vent in the rear wheel arches to help channel out the wake created by the wheels. This, Ferrari says, smooths out flow to the rear diffuser, boosting its downforce by 5 percent. Aerodynamicists and designers also changed the shape of the sides of the front bumper, hollowing out the surfaces under the headlights to make room for “flicks” (which are split by turning vanes), and including another air intake in front of the wheels. Underneath, Ferrari added vortex generators on the belly pan, which “capitalised on the accelerations created by the rear system and the front underbody” and ultimately added 30 percent of the car’s additional downforce over the FXX-K. The car also gets redesigned brake air intakes, a re-tuned suspension, a bigger interior display, and a new steering wheel. The Ferrari FXX-K Evo, which is not meant for road use and “will not be used in competition outside its dedicated programme,” can either be bought outright as part of an “extremely limited-run,” or current FXX-K owners can have their vehicles upgraded. If I owned an FXX-K, I’d be tempted by this package; that just seems like an awful lot of downforce-y goodness to pass up.